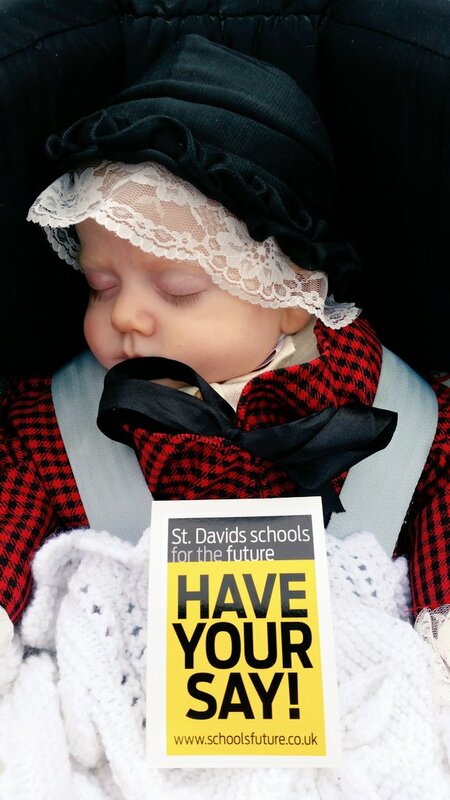 St Davids schools for the future is holding two meetings to gather your views and turn them into a proposal on behalf of the whole community. We will gather support for the proposal through a petition and if we can speak with one voice it will carry a lot of weight. The Council can then choose to incorporate our views or ignore them. If it ignores them we can object which will force the decision to go to the Welsh Government. If things go that far there will be a lot of lobbying to be done in the run up to next year’s Council and Assembly elections! But the council is showing flexibility and a willingness to listen so hopefully things won’t go that far if we come together to make our voice heard. Again I wish to express my concern that though inevitably SaveYDS has to talk to the council it would be an utter folly to respect their ‘flexibilty and willingness to listen’. Kate Evan Hughes and Jamie Adams are the people who oversaw the previous ‘consultation’, which we all know led to a complete travesty – and which may have led to the closure of the school but for the magnificent intervention of the community. We must therefore ‘deal’ with them on the basis that (quite simply) they cannot be trusted.